It’s 1989 and we’re in a 75 year old grain elevator. The team of Doug Odell and his sister Corkie are hard at work brewing beer. What started as a kitchen hobby has become a profession, fuelled by self-belief and a passion for great beer Odell Brewing Co. is conceived in Fort Collins, Colorado. Fast forward to 2010 and we’re in an awkwardly shaped room on the first floor. Origami skills are being put into practice, desperately turning menus into emergency fans. Extra buttons are being unfastened, windows opened and jackets removed. It’s hot, very hot, but beer is on the way. In one corner stands Doug Odell, he’s fighting with a laptop and projector, watched eagerly by an audience of beer lovers, makers and critics. We’re gathered to sample Doug’s beer and to toast its launch in England. Our first beer is Easy Street Wheat. American Wheat Beer is a style I really struggle with. Devoid of the ester driven fruit, bubblegum, clove and banana of their German ancestors, I find them a bit plain and boring. Unfortunately Easy Street doesn’t go anywhere towards changing that opinion. Served with tempura prawns, it was nice, but nothing more than that. People around me appeared to enjoy it, going back for seconds when the opportunity arose, maybe it’s just me? 90 Shilling Ale was full of brown bread crust, treacle and some subtle black coffee. Fresh with a gentle sweetness at first and a slight tartness in the finish. As it warms some subtle hop comes to the fore, bringing woodyness and spice. 5 Barrel Pale Ale is named after the size of the test brewery at Odell. It kicked things on with some gentle hopping. Doug Odell is a real fan of UK brewing and as a result picked Fuggles and Goldings to use alongside the American Willamette hop in this beer. The fact that it's the third best selling Odell beer is testament to how incredibly drinkable it is. Poured with delicately spiced Cajun chicken; the hops amplified the chilli heat and brought cleansing bitterness after the swallow. If the 5 Barrel is the quite kid at school whose home work you copy, Odell IPA is the hyperactive brat that's screamy and shouty, desperate for the teacher's attention at all times. The body is thicker and fuller than any of the other beers we tried. There's melon, pithy grapefruit bitterness and floral orange in abundance. Delicious, and more than a match for the fiery lamb curry it was paired with. A step back down from the IPA brings St. Lupulin. Lemon sherbet hops, a strong malty backbone of biscuit and honey, a delicate bitterness that catches you by surprise. Bags of hop flavour and a lack of punishing bitterness make this stunningly drinkable. My favourite beer of the night and delicious with citrus ginger nut cheese cake. To finish the night off, a classic combination. Porter and chocolate. Tonight it's Cuthroat Porter and chocolate tart. The beer is all coffee and roasty malt, it rips the bitter chocolate flavour out of the dessert kicking and screaming, then the lightness of the beer clears it all away. Lovely. Some great beer and some great food. 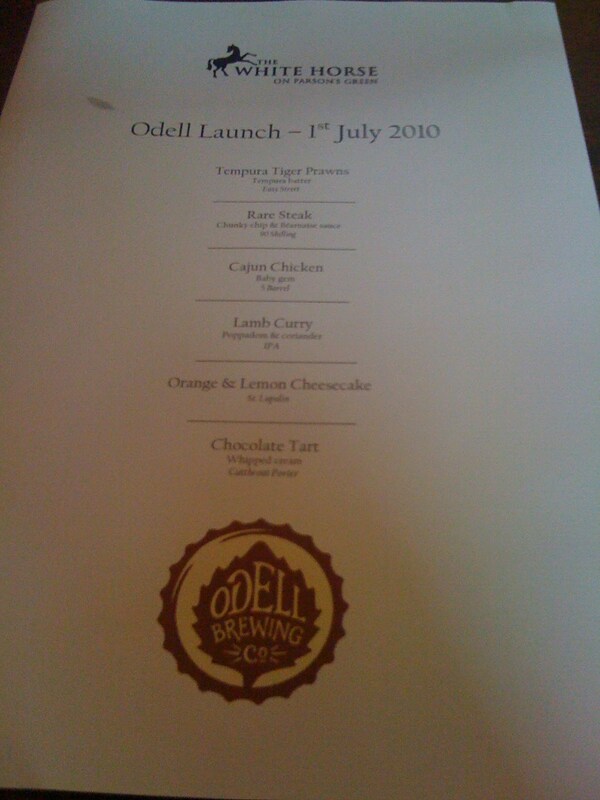 Hopefully this launch will see us UK beer lovers finding it easier to get hold of Odell beers on home turf. The St Lupulin is an outstanding beer, perfect for summer and something I could drink a lot of. Fingers crossed. Thanks to Dan from The White Horse for the invitation. If you've never been to The White Horse on Parson's green ... get yourself there ASAP. Great post and it sounded like a cool evening. Some nice pairings there. The St Lupulin and the IPA were both excellent on draught at the US Beer Fest. I missed the event in Leeds last month - was gutted! Been a fan of Odell for a while now. St Lupulin is an awesome beer, and I've got a bottle of the IPA in the cellar now. Doug Odell is an unsung hero in my book! Love the White Horse, always has a terrific range even when it's not festival time. Seeing as it's coming up to festival season you might want to (if you haven't already) try the Bricklayer's Arms, about 20 minutes walk across the river from The White Horse in Putney. It's always got all the Timothy Taylor ales on as well as 2 guest ales which change weekly. However, the jewel in the crown is the bi-annual beer festival which covers a region of the UK. Last summer it was (I think) Devon and Cornwall, and I think they've done Yorkshire as well. Either way, they stack about 60 casks of unusual regional ales up in the beer garden, and you can order pints straight from them. Go the week after, and you can have a pint of whatever's left for 50p. Really great way of sampling regional ales. Thanks for the tip Mary. I know of The Bricklayers Arms but still havent managed to visit. I'll look out for the festival.